It’s tempting to consider a group like the Harlem Quartet as something of a novelty act. The group identifies itself with a center of African-American culture, not the place you usually think of as a classical chamber music hotbed. And its programs usually feature contemporary music, most of that produced or influenced by cultures that aren’t mainstream chamber music sources. Forget all that, though. 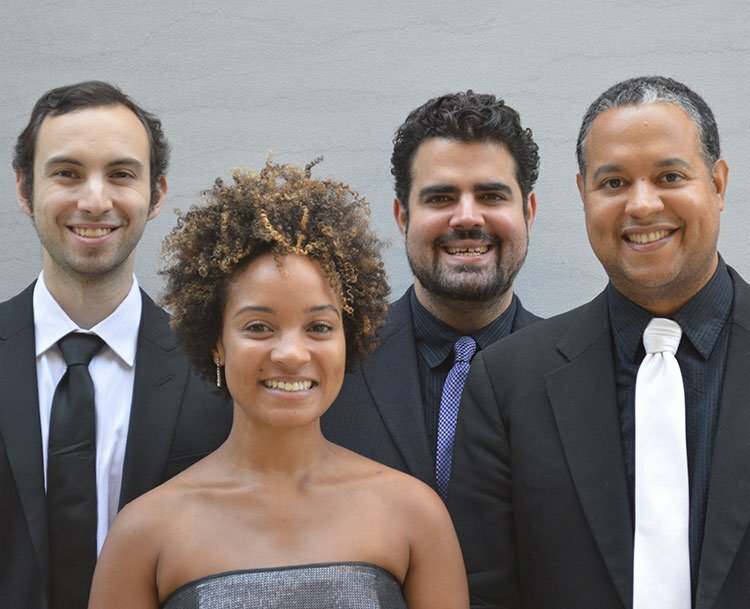 The Harlem Quartet returned to Maverick Concerts on Sunday with a program as substantial as most of what we’ve heard this season, and as well-played as any. From the opening moments of Turina’s La Oracion del Torero (The Bullfighter’s Prayer), it was obvious that we were in the presence of interpretive greatness. It began with miraculously light and deft sound and ensemble, exquisite, floating in air. This is a familiar piece and I’ve heard it played and recorded by well-known quartets, but I’ve never heard a better performance. Gabriela Lena Frank, where have you been all my life? I want to take you home with me–your music, that is. (I’ve already ordered one CD.) Frank’s Milagros (Miracle”) is a series of eight short pieces inspired by various sights and cultural aspects of her ancestral home of Peru. (She’s American-born, 1972.) Through nearly half an hour of music I didn’t hear a dull moment, only a consistently stimulating succession of musical ideas, using advanced techniques along with folk influence. Frank uses the medium of the string quartet with great inventiveness and imagination, occasionally building on the scoring ideas of Bartók. (But even he didn’t have the idea of opening and closing a string quartet with a movement for each of the violinists, playing solo.) The second Milagrito (small miracle), the first one involving the entire quartet, was inspired by “Broken Panpipes” (its title) found in a pre-Incan temple in the central Andes. It’s compellingly powerful, dissonant music. “Milagrito” No. 5, “Shadows of Amantani,” was eerie. No. 7, which the composer describes as “playful in character,” was downright funny at moments. I jotted down these highlights, but there weren’t really any highlights in this work, which maintained its high level of interest throughout. I think this piece deserves a place in the string quartet repertoire. It’s the most entertaining music I’ve met so far this year. No doubt the strong performance aided my strongly positive reaction. Guido López-Gavilán, a Cuban composer and conductor, and father of the Harlem Quartet’s first violinist Ilmar Gavilán, wrote Cuarteto en Guacuanc (a dance rhythmic pattern), a rhythmically strong pops piece, five and a half minutes long, with imaginative percussion effects. It was a lot of fun and would make a great quartet encore. There are no profundities to explore in Alexander Borodin’s String Quartet No. 2, in D Major, just a well-constructed and consistently pleasing continuity of remarkably pretty music with some memorable tunes. (Two of them were parts of the score of the musical Kismet which earned Borodin a posthumous Tony Award!) Again, from the very beginning the Harlem Quartet’s smooth, warm sound let me know I was in for a good time. The ensemble’s beautiful sound and flawless coordination remained consistent throughout the piece–except in the famous Notturno, where, when the melody moved from cello to first violin, Gavilán thinned out his tone. It was obviously deliberate since his sound was gratifyingly rich elsewhere. I heard more viola than usual in this music, which helped fill out the tone and revealed some complexities of texture I’d never noticed before. The Harlem Quartet has collaborated on some jazz projects. Its encore, an arrangement of Billy Strayhorn’s famous “Take the A Train,” included solos for all four players. Violist Jaime Amador’s was notably virtuosic. From where I was sitting it looked as though the entire arrangement might have been written out in the scores the players had. But since it was second violinist Melissa White’s mother’s birthday, and the mother was in the audience, I figured that she probably improvised her interpolation of “Happy Birthday to You.” Maybe all the solos were. Though string quartets have been very well represented at Maverick this season, none has been more enjoyable than the Harlem. Perhaps the foursome could offer a Haydn, Mozart, or Beethoven next time, although I’d hate to lose the novelties it brings. Enjoyed reading your review, Leslie. I was at the concert also and thoroughly enjoyed it. Although i wasn’t as enamoured with the first violinist’s sound—It was good but not as rich as I wanted from the first violin. Definitely an interesting program. Maverick definitely is THE BEST place around to hear chamber music in the summer. Love the acoustics and setting. When they got to the ending strains of the Turina, I realized how special it all was. I agree, I would love to hear the Frank again. I thought the timbre variation that Mr. Gerber refers to in the Notturno of the Borodin was a very effect change of color that enriched the atmospheric effect. I’m eager to hear the Harlem Quartet again, not in Haydn, Mozart, or Beethoven, but in more discoveries, both new and old — perhaps Joseph Bologne (Le Chevalier de Saint-Georges), Maddalena Laura Sirmen, or Emilie Mayer.